Which Phantom Do You Remember? One of the most pleasant aspects of this research project has been the reaction I get from people who discover that I’m writing my thesis on The Phantom. I attended a dinner party in Melbourne (Australia) recently and half of the guests present had either direct recollections of reading The Phantom as children, or knew a relative or family friend who avidly followed the adventures of “The Ghost Who Walks”. One of my dinner companions recalled owning a coveted Phantom ‘skull ring’ (with “red ruby eyes”), while another said they’d read The Phantom well into their early 20s, before handing their collection over to their father for him to read. Still another guest remembered their brother storing his collection of treasured Phantom comics in a plastic tub under his bed. On one level, this is always a gratifying experience for me, as it confirms my long-held hunch that there is a largely untapped collective memory among Australians about The Phantom, which hints at the character’s enduring status in Australian popular culture. On another level, such responses demonstrate just how much comic-book characters like The Phantom can serve as time-capsules of nostalgic memory. This is becoming evident in many of the responses I’ve collated in my online reader survey, with many “phans” from Australia, India and Sweden explicitly referring to The Phantom (or ‘Betaal’ and ‘Fantomen’, in the latter two instances ) as a fond part of their childhood or adolescence. Yet even though all of my survey respondents have a shared experience of reading The Phantom, they have not necessarily been experiencing the same character – or, at least, not the same incarnation of The Phantom. To demonstrate this point, let me share with you my own first encounter with The Phantom, which came about when my parents purchased for me a copy of The Phantom No.631 (Frew Publications, Australia) back in 1978, which reprinted the Lee Falk/Ray Moore storyline, “The Diamond Hunters”. I knew nothing of this character at the time, but I was immediately captivated by his menacing appearance, the sheer terror his very name caused among his enemies and his relentless pursuit of the evil killer, ‘Smiley’. I was also entranced by the atmospheric artwork (awash in dark black and grey tones), which made the story appear as if it were being transmitted from some distant, almost primitive, time or place – at least, it felt that way to me at the time. Yet “The Diamond Hunters” was, paradoxically, both old and new at the time when I first read The Phantom. By 1978, this particular story was already 40 years-old, yet it was entirely new to me, even though I sensed at the time that it was not truly “modern”. Nor did I realise that this was fourth instance that Frew Publications had reprinted “The Diamond Hunters”, and had in fact been reissuing this story roughly every five years or so – a publishing strategy apparently based on the belief that the magazine’s readership turned over at five-year intervals. “The Diamond Hunters” undeniably forms the basis for my own nostalgic ties to The Phantom – yet strictly speaking, it was not a product of my 1970s childhood. 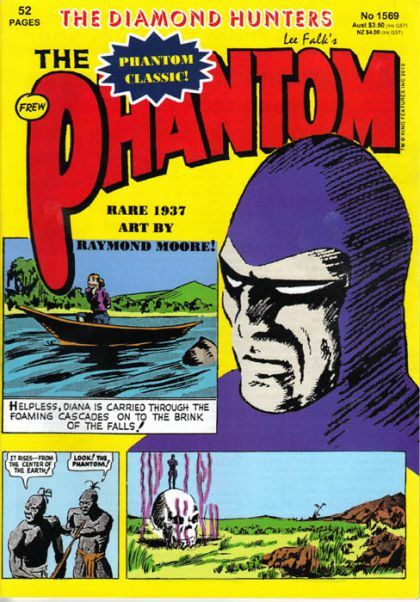 It was, in the chronological sense, a by-product of my father’s childhood of the 1930s and 1940s – although I never recalled him mentioning ever having read The Phantom (He did recall reading other Australian comics of that era, such as Captain Atom and The Bosun and Choclit). Until I began this research project, I could only speculate if similarly “vintage” Phantom stories from the 1930s and 1940s resonated with an earlier generation of Australian readers, who might have first seen it unfold every week in The Australian Woman’s Mirror, or pored over it in treasured copies the first Australian series of The Phantom comic-books issued by the Woman’s Mirror throughout 1938-1940. Now, hopefully, this project’s online survey may reveal if stories like “The Diamond Hunters” were as compelling to the first generation of Australian readers who grew up reading The Phantom, in the same way that it excited my imagination back in 1978. Yet this minor, personal recollection also demonstrates just how significant a role the external mechanics of international publishing and comic-strip syndication play in furnishing us with the mass-media entertainments that form such a large part of our childhood memory – a point that Fred Davis discusses at length in his book, Yearning for Yesterday: A Sociology of Nostalgia (Free Press, 1979). 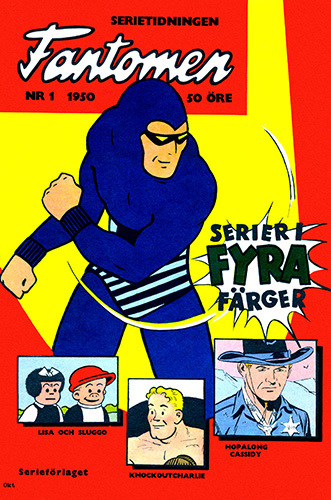 The availability of specific stories, the ways in which they are modified and repackaged for global consumption, and the editorial practices of international publishing partners – all of these have a bearing on when and how different incarnations of The Phantom comic-book franchise were circulated over decades within Australia, India and Sweden. As a result, even though audiences in each of these countries do read and enjoy The Phantom, their experience of this individual comic-book series is markedly different – not only from each other, but also across successive generations of readers within each country.